#AskExcelinEd: What does Perkins V mean for CTE accountability? 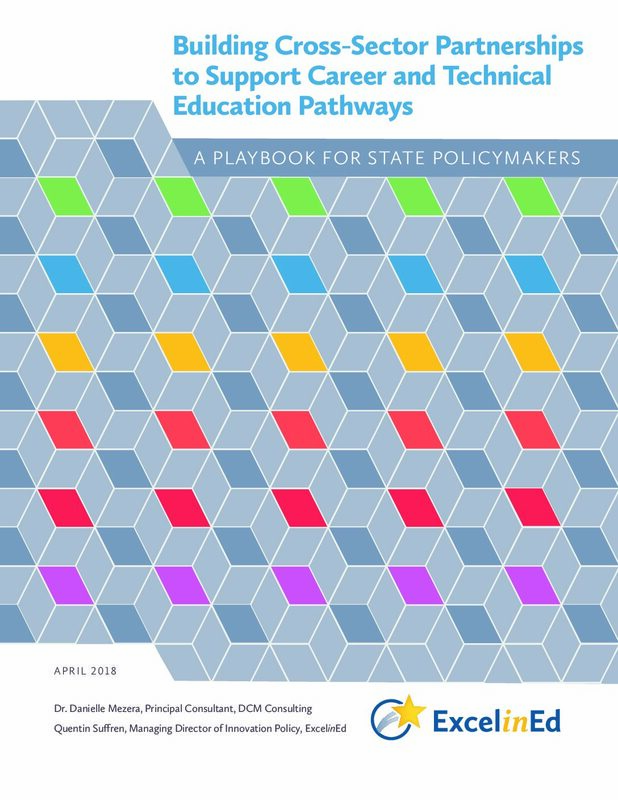 ExcelinEd’s new brief Perkins V Reauthorization: Opportunities, Challenges and Risks for States identifies eight shifts Perkins V makes that present critical decision points for states pursuing high-quality CTE programs. In today’s post, ExcelinEd’s Melissa Canney examines the reauthorization’s impact on accountability goals for state CTE programs. Under Perkins IV, states negotiated their performance levels with the U.S. Department of Education. Like ESSA, Perkins V empowers states to set their own state-determined levels of performance for each of the four years covered by the initial state plan, based on specific criteria. The level of each core indicator of performance must be the same for all concentrators in the state. The target level should also require the state to make meaningful progress toward improving the performance of all CTE students, including subgroups. These performance levels must be included in the state plan public comment process and approved by the U.S. Secretary of Education based on the criteria set forth in the law. States will continue to lead negotiations with local recipients related to local performance levels (where applicable), which must equal the state total when aggregated. 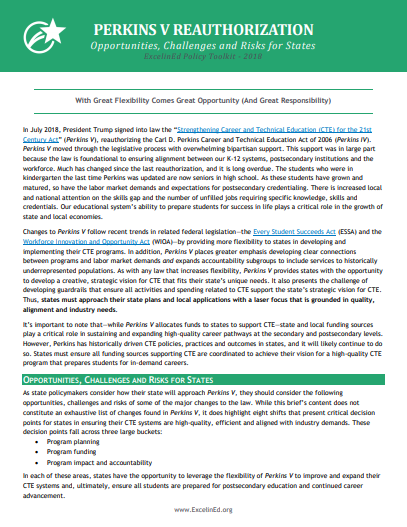 State-determined levels of performance allow states to set long-term and annual goals through the Perkins V accountability framework that align with their strategic vision for CTE. Additionally, the legislation encourages states to align their Perkins V performance goals with other statewide goals (e.g., ESSA, WIOA or other state-specific initiatives). States that triangulate with existing goals can leverage related initiatives and resources to help stakeholders support shared goals. States also have the opportunity to invest in the development of or upgrades to data collection systems to integrate Perkins reporting requirements with other important CTE indicators, along with other state and federal measures. 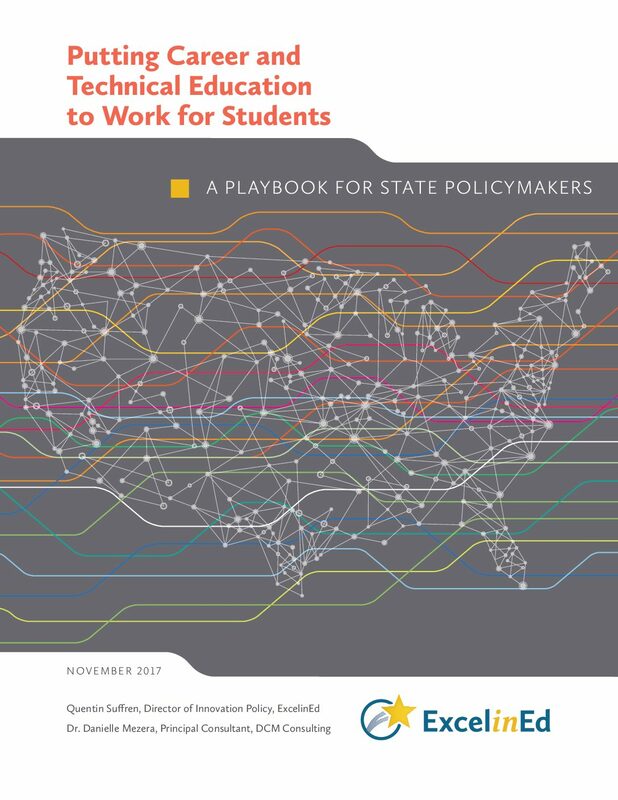 States that approach this thoughtfully could gain information about the effectiveness of career pathways and student outcomes. This could also help states streamline the reporting process and more seamlessly evaluate their states’ interconnected needs and goals. While this change allows states to determine their own performance levels, it also presents some challenges. Setting ambitious and achievable goals for state accountability systems is difficult. States that set goals that are not ambitious risk setting lower expectations for what their students can achieve, while states that set goals that are not achievable risk stakeholder discouragement and loss of trust. States may not currently collect sufficient data to set appropriate goals and report on all the required indicators. This is especially true at the secondary level. The new CTE concentrator definition, combined with new quality program indicator options, may require some states to set initial goals without baseline data. States may face challenges in setting goals that are both ambitious and achievable while they update their data systems to collect new data. Collect and publicly report information about students who complete in-depth CTE experiences (3-4 credits within a CTE program or program of study). Implement policies and programs that encourage the completion of advanced CTE coursework. Integrate state data systems to more easily connect and analyze student benchmarks and outcomes related to college and career readiness. Ensure this data infrastructure captures and publicly reports on multiple measures of CTE program quality, not just the measure(s) chosen for Perkins reporting purposes. Establish rigorous criteria to ensure that the student experiences related to each of the indicators of secondary CTE program quality are rigorous and aligned with the student’s preparation for his or her field of interest. 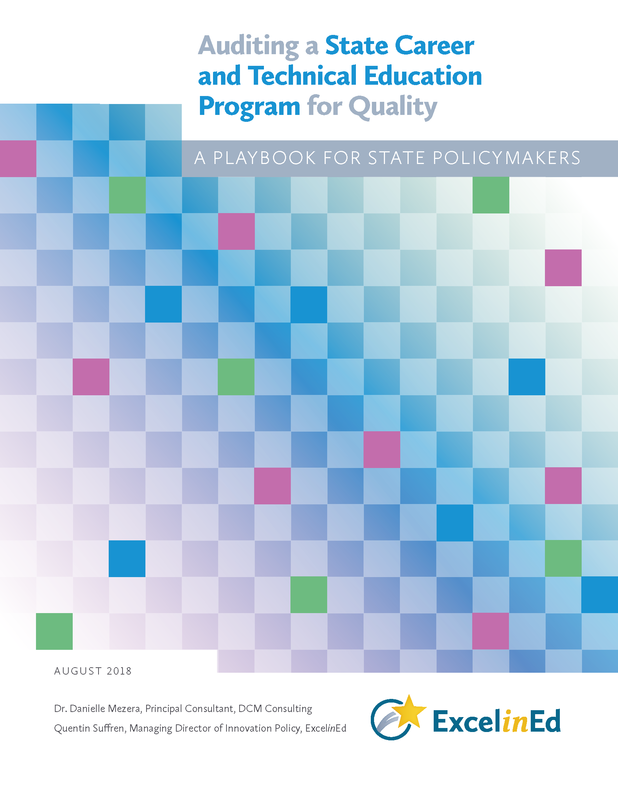 Align state-determined levels of performance for secondary Perkins program quality indicators with other existing state goals (e.g., ESSA, HEA, WIOA and/or state-specific workforce development goals). Ensure all Perkins state-determined levels of performance are both ambitious and achievable.